Suzy is a sweet little girl who needed a service dog to give her a sense of familiarity in strange situations. Suzy was diagnosed with autism, something that can sometimes cause overwhelming moments when faced with unfamiliar surroundings. 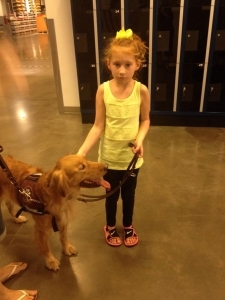 A service dog will allow Suzy to transition from place to place and feel safe with a furry companion at her side. Several fundraisers were held to support Suzy in receiving this special dog and Team Asa was happy to be a small support in helping this little girl receive her new friend.